This copy of Dorset Life in Poole is presented to you with the compliments of Dorset Life – The Dorset Magazine: Dorset's independent and longest-established county magazine. Dorset Life – The Dorset Magazine celebrates the best of Dorset in words and pictures every month. 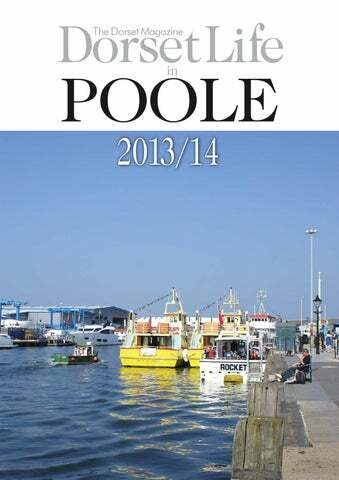 Within the pages of each issue is the history, landscape, villages, people, presentday activities, wildlife, historic buildings and gardens of Dorset, Poole and Bournemouth. Presented to the highest standards of editorial, photographic and printing quality, by a small team Dorset Life – The Dorset Magazine is essential reading for everyone with a love of, or an interest in, Dorset. newsagents in Poole and throughout Dorset. Do you own a tablet or smartphone? If you have an iOS or Android device, you can now download the free Dorset Life App, view a free sample magazine and then buy individual issues of the appbased version of Dorset Life – The Dorset Magazine. 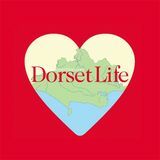 For more details, visit www.dorsetlife.co.uk/app or search 'Dorset Life' on the iTunes or Google Play stores. (%/!ƫ5+1.ƫ .%2%*#ƫ!4,!.%!*! đƫ%ġ"1*0%+*ƫ	ƫ!*+*ƫ$! '!ĩ Contact us today to book your test drive. WWW.WESTOVER.POOLE.JAGUAR.CO.UK 01202 974948 HOW ALIVE ARE YOU? Official fuel consumption for the Jaguar XF range in mpg (l/100km): Urban from 16.7 (16.9) to 48.7 (5.8). Extra Urban from 32.8 (8.6) to 64.2 (4.4). Combined from 24.4 (11.6) to 57.7 (4.9). CO2 Emissions from 270 to 129 (g/km). On the road price is the Manufacturer’s Recommended Retail Price plus Car Tax, First Registration Fee and Delivery Pack. The ﬁgures provided are as a result of official manufacturer’s tests in accordance with EU legislation. A vehicle’s actual fuel consumption may differ from that achieved in such tests and these ﬁgures are for comparative purposes only. Models shown are XF Saloon Diesel S Premium Luxury and XF Sportbrake Diesel S Premium Luxury with 20” Kalimnos Gloss Black alloy wheels and Black Pack. Recommended on-road price for XF Saloon (including options): £47,775. Recommended on-road price for XF Sportbrake (including options): £50,375. Poole Park photo essay Joël Lacey wanders round Poole's largest public space Just under twenty percent of Poole, by area, is occupied by Poole's three main public parks: Hamworthy Park (27 acres), Upton Country Park (100 acres), and Poole Park (109 acres). All three hold the prestigious Green Flag award and, as well as being the biggest of the three, Poole Park is the oldest. It was built on land donated by Lord Wimborne and opened in 1890 by the then Prince of Wales, later King Edward VII. Nearly two thirds of the park is actually water, with the Poole Park Lake forming the lion's share of that figure. The lake is a mix of saline and fresh water – more accurately of brackish water from Poole Harbour, local surface water drainage run-off and rainwater. There are sluice gates at the railway embankment, through which – during the spring tides only – water can be exchanged between the lake and harbour. As well as the boating lake â&#x20AC;&#x201C; which has a separate section for model boats and yachts, and where one can hire full-sized dinghies, pedalos, kayaks, windsurfing boards and rowing boats â&#x20AC;&#x201C; Poole Park also has a miniature railway, a miniature golf course and a fullsized bowls club and tennis courts. The tennis club also has some LTA-approved mini-red courts esecially designed for younger players. In terms of natural life, the park is splendidly planted with specimens from all over the world, has a wide selection of mature trees and possesses a vigorous population of wildfowl and visiting birds. On Poole's Vibrant Quayside Café & Bar (Lower Deck) Breakfast from 7am - beverages, licensed bar, menu all day every day! Our elegant and sophisticated fine dining restaurant is situated on the first floor of this historic landmark. We pride ourselves on our outstanding reputation for both culinary excellence and service. All our dishes are freshly prepared to order, sourcing only high quality local produce. We cater for all occasions, from a romantic meal for two, special birthdays or for larger parties and weddings. Our staff are commited to providing friendly and efficient service to guarantee a memorable experience. Watch the world drift by whilst relaxing in our café bar on the water's edge. Our menu caters for all appetites serving from a selection of locally caught oysters, perfectly steamed mussels as well as West Country reared beef. Our attentive staff will cater to your every need from expertly mixed cocktails, extensive wine list or freshly ground coffee. Whether it is breakfast, lunch, dinner or sundowners, share your experience with us and others at the Custom House. You won't be disappointed. Just sit back, relax and enjoy the view. Poole Quay Those who visit and work on the quayside explain what is so special about it Becky Knight – works on the Quay I suppose my favourite time of year is early in the summer when everything starts to get going for the season and it starts to get busy in the Welcome Centre, but I like the fact that it's completely different in the winter and summer. there's always things to do and though it's almost impossible to pick out one thing, I'd recommend that everyone goes for a cruise around the harbour to get a real feel for Poole. The area around the quay is a wonderful mix of small businesses and nationally famous ones like Lush and Sunseeker. Peter Brice – comes fishing 3-4 times a week I moved to Poole a couple of years ago when I retired and I just love coming down to the Quay. It's bustling, but peaceful at the same time. I used to be a long-distance lorry driver and used to come through Poole and I said I'd come and live here when I retired. I fish with mealworm but I've caught nothing today – the water's running too fast, but yesterday I caught a 3lb plaice, a wrasse and a bass. The dog loves it round here too and sometimes he'll swim part of the way home as I walk. hile most people are aware of the existence of Inheritance Tax (IHT), it is a subject which gives rise to some distaste or lack of interest and many, not surprisingly, would rather delay consideration of the matter. So few people do anything about their potential IHT liability, the result is that HM Revenue & Customs (HMRC) collected ÂŁ3.1 billion for 2012/2013 alone (source HMRC Annual Report & Accounts 2012-13). The Partner Practice represents only St. Jamesâ&#x20AC;&#x2122;s Place Wealth Management plc (which is authorised and regulated by the Financial Conduct Authority) for the purpose of advising solely on the Groupâ&#x20AC;&#x2122;s wealth management products and services, more details of which are set out on the Groupâ&#x20AC;&#x2122;s website www.sjp.co.uk/products. The title â&#x20AC;&#x2DC;Partner Practiceâ&#x20AC;&#x2122; is the marketing term used to describe St. Jamesâ&#x20AC;&#x2122;s Place representatives. At Synergy you can be assured of the very highest standards of hairdressing accompanied by that personal touch. After all, it’s all about you. Jane Jones – Lived in Ashley Cross 'A long time' and, for 13 years, organiser of the Party in the Park I moved here for work twenty-five years ago and have lived in the area ever since. I love it because there's such a strong community atmosphere. It's leafy, we're close to the sea, close to Bournemouth and Poole without being in the town centre. We started with 'Brunch in the park', but the event has grown and grown to be a two-day festival with something for everyone from toddlers to 80-year olds. All our food for the event comes from the lovely local bars and restaurants and they all do something slightly different – we get overtures from other caterers outside the area, but we like it to be a really local event, with all ten of the bands playing over the two days coming from Dorset. Night-times, especially Fridays, are busy as lots of people come to eat and drink in Ashley Cross. In general I describe it as a friendly, very much a community atmosphere where everyone knows everyone else. Debbie Perkins – local trader for eight years There's lots of lovely businesses round here and the locals are brilliant. Some of my customers have asked why I haven't moved to a bigger retail centre, but I wouldn't because I love this area. We're not on the internet; we are, like a lot of small businesses round here, focused on personal service – even the banks are really helpful – and I try to buy as much myself round here as I can. There's definitely a community feeling where we all look out for each other – taking in parcels and so on and it's definitely the place to come for an evening; there's great food and drink round here. Ashley Cross What's the attraction of this part of Lower Parkstone? Dorset Life in Poole finds out. A truly unique Island Holiday Experience Situated in the sheltered western portion of Poole Harbour with breathtaking views of the Purbeck Hills, Corfe Castle and the RSPB Reserve at Arne, privately owned Round Island provides a very unique holiday experience for bird lovers, boat owners and anyone seeking peace and tranquillity in this beautiful part of Dorset. t1SJWBUF*TMBOEXJUIXPPEMBOEBOE beautiful fauna. t4BOEZCFBDIXJUITIBMMPXXBUFS WFSZ safe for children. t%FFQXBUFSDIBOOFMBQQSPBDITPCPBU owners are particularly welcome. t1POUPPOPSTXJOHJOHNPPSJOHTGSFFGPS guests with vessels up to 40ft. t$BSFUBLFSTMJWFPO3PVOE*TMBOEBOEXJMM transport you to the Island from our Poole Marina base. residential care, through to specialist dementia and respite care. All provided by our compassionate, highly experienced team. If youâ&#x20AC;&#x2122;re looking for the very best in quality care for your loved one, come and visit us today. ome and visit the unique collection of designer fashions available in all sizes from 10 to 30 at Figure Eight this winter and complement your outﬁt from our range of hats, bags, wraps and stunning jewellery. Excellent Education Enriching Environment At Yarrells, we combine academic study with sport and the arts to achieve excellence in every child’s education. The school is set in beautiful grounds where pupils enjoy the benefits of woodland, gardens, playing fields, swimming pool and tennis courts. Children gain the advantage of a head start in the Early Years, culminating in a dynamic and successful study programme for pupils aged 11+ to 13. Pupils thrive at Yarrells and we are ambitious for every child. Eric Wilson & friends – annual Sandbanks visitors from the Home Counties We started coming here with the kids ooh, decades ago. Now the kids have grown up and go on their own holidays but we still come here, and now we don't have to come during half-term. There's always something to do on the water so we'll come down here in the morning, bringing a packed lunch or nipping across to the mini-mart next to the Watersports academy, then back out onto the water, back to the hotel to change and then we'll grab something to eat in one of the restaurants… and then we sleep… we sleep so well down here. Then, the next morning, we get up and we'll do it all over again. David Dixon I love the natural surroundings and I'm a surfer so I'm in the water every day. I live above the café and I can see the harbour from my bed. I also love the people; we get all kinds of people coming in: famous people, wealthy people… people from all around the area. They've all done interesting things and been interesting places so, as I go travelling a lot, we talk about all the places we've been. Lots of regulars call us by our first names and vice-versa and we've got one group of people – we call the coffee club – who come in every day; it's a real community here. In summer there's a real buzz around the place. In winter, Sandbanks gets quieter, it's almost like the peninsula becomes an island… but the waves get better too so I like it just as much. Visit Wimborne Minster a town for all reasons - a unique destination The historic market town of Wimborne Minster: an enticing blend of old and new Relax and enjoy the natural beauty of Wimborne’s setting on the River Allen and the historic architecture of the Minster Church of St Cuthburga. Shop in Wimborne’s high-quality modern stores and charming independent boutiques. The colourful Town Square and attractive streets offer a diverse mix of clothing, furnishings, gifts, jewellery, crafts, books, music, ﬂower and antique shops, as well as all those handy food, hardware and everyday stores. Enjoy a relaxing lunch, a tempting afternoon tea, or a delicious evening meal in one of a range of places to eat including cafés, pubs and restaurants. There are lots of places to visit in this unique town: the Tivoli Theatre, the famous Model Town, the Walford Mill craft centre, and the Priest's House Museum, to name just a few. Love Wimborne this Christmas The Christmas lights are switched on the 30th November following a day of entertainment on the square. Father Christmas will be in the square on Saturday 30th November, 7th, 14th and 21st December this year. The 7th December is another day of Christmas festivities with something for the children to enjoy. Wimborne’s Late Night Shopping is Thursday 12th December with a warm welcome in the town’s many unique shops. On the 14th December ‘Save the Children’ celebrate their 25th Anniversary with festivities on the square and their annual Christmas parade in the afternoon. There is a Carol service in the Cornmarket on Friday 20th December and the festivities continue in the square on Saturday 21st December. Monday 23rd December the Dorset Youth Marching Band support the Mayor's appeal. Wimborne will be sparkling this Christmas For more information on events taking place in Wimborne please visit the Tourist Information Centre or go to www.wimborneminster.net This advertisement is published by Wimborne BID Ltd, a Business Improvement District making Wimborne great! Diverse Abilities Plus is Dorset’s only disability charity supporting children and adults with physical and learning disabilities, and their families, through a range of services. Langside School provides tailored curriculums for children with profound and complex disabilities, aged 2 to 19 Children’s respite projects including home support, day and overnight care, holiday and after-school activities, a youth club and parent support Adult support including a day opportunities centre and supported living service helping adults live independently in their own home Advice service providing assistance for adults and children with disabilities and anyone in Dorset who needs advice on disability beneﬁts, lasting power of attorney or deputyship. or physiotherapists wherever necessary. 'Our people know the children better than anyone,' says Jonathan. 'So if a child has to have an operation, for instance, the physiotherapist will make sure the bed and environment is correctly set up for them.' Langside is all about safeguarding the children but clearly its mission is also to ensure they learn. Like other specialist schools of its kind, it has been following the national curriculum, but with the Government giving all schools more control over what they teach with a focus on relevancy, Langside has been working on a new approach to its curriculum, which was part of Jonathan's remit when he joined. After October half-term, Langside will start to roll-out 28 individually tailored curriculums for each of its pupils. It will focus on the sensory responses and needs of each child, an area in which the school has long been seen as a centre of excellence. It has also consulted with external experts, such as Dr Penny Lacey, programme supervisor for the severe, profound and multiple learning difficulties programme in the School of Education at the University of Birmingham. 'A skeleton framework will be introduced first and it will probably take another two years to fully implement it. 28 different timetables will be a challenge and there will probably be timetable clashes, but we have been working on it solidly for ten months and are confident it will go in the right direction,' says Jonathan, who adds that he and his team have also taken care to ensure it doesn’t ‘dismantle’ all of the great things about the school and its heritage. 'We want to preserve that Langside magic and family feel but combine it with a world-class curriculum so we achieve the best possible outcome for the children.' • There are many ways in which the local community can support the charity and the school. There are fantastic challenges – running marathons, climbing Kilimanjaro, walking the Sahara desert – or they can contribute by attending events: music and dinner evenings, swishing parties, bake sales and so on. Local people can also volunteer for the charity at events, painting at Langside School or helping out on outings. For further information on Diverse Abilities Plus visit www.diverseabilitiesplus.org.uk or call 01202 718266. Keep up to date with upcoming events and news from the charity on Facebook – www.facebook.com/diverseabilitiesplus and via Twitter - www.twitter.com/diverseability. The 320m wide harbour entrance as seen from the air. Bramble Bush Bay is waiting at South Haven for the large incoming ship to pass through. Bramble Bush Bay nearing North Haven with its prow up. The black ball above the control cabin is a day mark which is raised when the ferry is in motion. The complete solution for all your tiling and bathroom needs. Design & installation services available. Plan your funeral, then enjoy the rest of your life... Dorset independent and family owned Funeral Directors A Dorset Funeral Plan is the practical answer to rising funeral costs. Giving you personal choice at today’s prices, regardless of when the funeral may be needed. The Dorset Funeral Plan is provided by your local, independent funeral director with an established reputation for quality of service. Our funeral plan has the following practical benefits: • You choose your own funeral arrangements, for your own peace of mind. • Plans are provided by local, Dorset Family-owned Independent Funeral Directors • You save your family from having to make difficult decisions, trying to guess what you would have wanted at a distressing time. • All options are clearly specified with fixed prices. • You can make a single payment, or pay by monthly instalments if you prefer. • Financial security – the funeral payment is held in Funeral Planning Trust until it is needed. and those involving a foreign element, with assets or beneficiaries abroad. Lloyd is a full member of STEP (the Society of Trust and Estate Practitioners) after several years of study and testing examinations. Lloyd is also a member of the Law Society’s Private Client Section and sits on the General Committee of the Bournemouth & District Law Society. In June, the ﬁrm also recruited Martha Swann to its Private Client Department. Martha grew up and trained in South-West London following a degree in Theology at Durham University. After an initial job in IT sales and recruitment, she decided that the law was for her and soon specialised in private client work. Following a spell at a well-regarded firm in Worthing, she moved to Poole to join Dickinson Manser, where her talents will be fully utilised. For further information on our Residential Conveyancing services, please contact Mark Daniels mjd@ dmsolicitors.co.uk or for our Private Client services, please contact Sarah Richards slr@dmsolicitors.co.uk. Ser vices for the Private Client. Dickinson Manser have experienced teams specialising in providing services for private individuals and their families which include: Conveyancing • Sale and purchase • Buy to let • Equity release • Lease extensions and variations Planning Ahead • Will making • Lasting Powers of Attorney • Elderly care Inheritance Tax planning • Probate and Trusts • Court of Protection Family Law • Divorce • Pre-nuptial agreements • Children and ﬁnancial arrangements • Care proceedings • Civil partnerships • Cohabitation Dispute Resolution • Contract disputes • Land and boundary disputes Negligence claims • Probate and will disputes • Employment disputes For further information please contact Mark Daniels mjd@dmsolicitors.co.uk or Sarah Richards slr@dmsolicitors.co.uk or telephone us on 01202 673071. Dickinson Manser. Ready when you need us. between appointments, but that’s an hour I’m on the street. You never know what you’re going to walk into around the next corner, which is the great thing about the job – it’s different every day. We use the bus a lot as well and the train, or we get lifts from one of the patrol cars.’ And then there are the bikes. If there’s a sight that’s sure to invoke John Major’s fabled ‘long shadows on county grounds, warm beer (and) invincible green suburbs’ it’s a policeman on a bicycle. The robust Raleigh Superb with its complete chain guard has been replaced by a lightweight Smith & Wesson machine and the boys in blue are now the boys and girls in hi-viz yellow, but it gets them around. ‘People are far more likely to share something with us if we’re out and about,’ says PC Simon Bridge. ‘It’s a vital part of our intelligence gathering. People who probably wouldn’t pick up the phone or come to the station will have a chat and tell you things that help us build a bigger picture.’ Within the SNT there are different roles as the police officers, with the legal powers and training to use them, lean towards offender management and the PCSOs concentrate on community engagement and victim liaison. ‘It’s a complete package,’ says Sgt Parr, ‘just like our work on the ground as an SNT supports the response teams or the traffic officers. All of us feed intelligence to each other. ‘We know that in our area residents are particularly concerned with speeding cars so we’re doing some work on that. They’re also concerned with dog poo in parks, but that’s less of a priority for us. We know there may have been a spate of burglaries that residents don’t know about because it hasn’t happened to them so it’s our job to know what crime is happening and ensure measures are put in place to combat it. ‘We’ve had a particular problem with vehicle crime, but nearly 70 per cent of thefts are from unlocked vehicles. Hamilton-Jones Antiques and collectables wanted for established client base. All oriental items, single items, collections, complete house or bank box contents purchased. Books, coins, china, clocks, furniture, jewellery, silver, stamps, pictures or anything unusual. Home Visits - Immediate settlement. We have been trading for 40 years in the area. those who needed to make their own sails or sheets as well as tarpaulins, flags, tents, and marquees for purchase or hire and even making outside-sprung roller blinds. Technology in the ship-building world changed over the next 100 years and, although some elements of the business remained unchanged as they sat cheek by jowl with H&A Burden's yacht chandlery (see October 2013 issue for more on Harry Burden), the move from sail to steam obviously had a large impact on the nature of the products being sold. When Burdens moved from the quay in 1963, Piplers took up the slack, as it were, and switched emphasis from being chandlers to merchant ships, to catering for the burgeoning leisure-craft market; they became yacht, rather than ship, chandlers. This year, therefore marks the 50th anniversary of that switch of emphasis and just as technology influenced the business in its early days, so the present owners and operators of the company have to keep pace with the everchanging world of maritime technology. The quay itself has changed character since John took over the company. Where once, yachts would tie-up directly outside the shop – and people walking along the quayside of an evening would be able to look down into the cabin, pleasure yachts now tie-up in the marina. John is torn as to whether this is a good thing or not: ‘as someone visiting, I’d probably rather be at a berth in a marina, but I feel the quay has lost something without yachts tying up alongside…, and it is obviously better for us if they can just walk five yards to come in.’ The company – and its staff members’ connection with sail also extends to their sponsorship of various classes and competitions at Poole Yacht Club over the years, and then there is the fact that Piplers will soon be the owners of a Sigma 8 racing boat. Then there are the shows – Piplers attends both the major boat shows in the UK, and these stands are often staffed by former and returning Piplers staff who know the shows and the store. ‘We have a pool of people we can call on to staff the shows,’ says Lawrence. In 2008, Piplers expanded into the building next door – Yeatman’s Old Mill, which is where the ‘hardware’ part of the chandlers is; the existing (original) Piplers building is now the home to the ‘software’: charts, clothes, hats and all the non-hardware elements. Looking around the quay John sees much that has changed: ‘Sunseeker is huge now and have really developed the other side of the quay; the ferry boats have taken over on this quayside and the quay, but there’s still working merchant vessels coming in.’ John himself was in the merchant navy prior to working for Esso and then for chart-suppliers Kelvin Hughes and finally taking charge of Piplers. Lawrence started his sailing career in Cheshire before his family moved down to Poole and his providential interview for a position at Piplers. ‘That was the last time I wore a proper pair of trousers,’ he remembers. Although the dress code at Piplers is casual, and the atmosphere with the customers relaxed – just two people, interested in sailing, discussing the relative merits of a piece of kit – the position of Piplers both physically, in terms of its quayside location, and philosophically, in terms of trying to ensure that sailors are properly equipped for whatever voyage on which they are about to embark, has altered little in the last 147 years.